One of the most popular actresses in south India, Amala Paul is set to have a big year up ahead. First up, her film Bhaskar Oru Rascal opposite Arvind Swami will finally be arriving on screens on March 29 after quite a long wait. Her film with Vishnu Vishal titled Raatchasan is said to be a psychological thriller and will be coming out later this year. She was also announced to be the female lead in the upcoming Malayalam biggie, Aadujeevitham, opposite Prithviraj Sukumaran with music by A. R. Rahman making it a return to Mollywood for the composer after a 25 year gap. That said, it has now been announced that Amala Paul has added yet another film to her kitty for 2018. Said to be a female-centric film, the movie is titled Adho Andha Paravai Pola and is a direct reference to iconic Tamil actor MGR’s popular song from the 1965 blockbuster film, Aayirathil Oruvan. Adho Andha Paravai Pola’s title as well as the first look were unveiled by actress Kajal Aggarwal on Twitter, who also shared her women’s day wishes with Amala Paul. In return, Amala Paul thanked Kajal Aggarwal for her gesture and great support. >>HOT: Amala Paul Gets Together With IPL Star? >>WOW: Spine Chilling Ratsasan Villain Revealed! 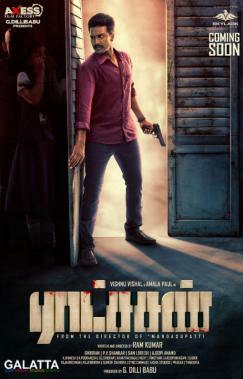 >>Ratsasan - Original Background Music Released! >>Top Politician Praises Ratsasan Movie! >>#MeToo: Vishal's Move On MeToo Movement!